After signing an Agreement in 2012 and having our fair share of start-up and fine-tuning problems our partner for South Africa and surrounding countries, Efekto in RSA, just completed the 100th batch of BioKill! A special thanks goes to Dieter Schäffner who was involved in many if not all of them. Congratulations and to the next 1.000! We are very happy to announce that Clean Kill is now available in Austria at the DM Online shop! Best to have Clean Kill at home, ‘cause summer is coming. Apply to prevent or if it’s too late and the creepy crawling or flying buggers are in the house already to get rid of them. 😊 You can order Clean Kill under following link: https://www.meindm.at/haushalt/shop/Dünger-%26-Insektenschutz/Ameisen/keine-Marke/Clean-Kill-Original-Insektenspray-für-den-Innenbereich/183982/2_10037706.action Also very important: If you like the product (and you will 😉) please give a good valuation of the product online. Thanks for your support! We open our new page with great news! 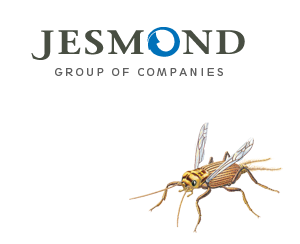 Our Portuguese partner F.Lima implemented an intern Supplier Assessment for 2017 and ranked Jesmond with 100% satisfaction. Thank you very much! We are glad to work with you on such a professional level. BiocidesHub Certificates for our Employees! Jesmond is very proud to have such diligent and committed employees! Mrs. Dr. Borjana Lubura and Mrs. M. Eng. Edyta Adamska have attended a seminar in Brussels, Belgium, to learn more about Environmental and Human Health Risk Assessment. Both completed the training and got an impressive certificate for participate the “Risk Assessment for Biocides”. Thanks Borjana and Edyta for your dedication! We are happy to pronounce that our partner Efekto RSA opened up another distribution channel and offers now also Bio Kill as Equine together with Bio Kill Extra GT. More and more diseases are spread through insects all over the world. Mosquito species appear in countries they never been sighted before. It, therefore, gets more critical to protect us against this plague every day by switching to preventive insecticides such as Bio Kill and Clean Kill. ProMED-mail provides the most significant information for you on a daily basis which and where diseases emerge on the globe. https://www.promedmail.org/ It’s not a question any longer that these diseases and virus carrying mosquitoes will move into Europe, the only question remaining is when it reaches your very own home! Hungarian BioKill TV Spot ! Bulgarian Partners expand distribution stores! Our Bulgarian Partners, Kamax, have started selling Bio Kill in more stores! As of mid June, you will be able to find Bio Kill in Metro Cash and Carry stores in Bulgaria – Way to go Kamax! New Clean Kill Blending and Filling plant opened in Nigeria! After much anticipation we are pleased to announce that our Nigerian partners, the Davaus Group, have opened a blending and filling plant for Clean Kill and have started with production! We are extremely excited for what the future of Clean Kill in Nigeria will bring and congratulate the Davaus Group on their achievements. We would also like to thank Enpro RSA for their hands-on technical and know-how support! New Marketing Advertisement from Hungary! We are happy to share images sent from our long-time partner, Multi G’s, most recent Marketing campaign on transport! Our well-respected partners in South Korea, Dong Sung Pharmaceuticals, have once again worked hard to accomplish the second Baby Fair stand at the BeFe fair this year. We are only too happy to receive impressions from the day from Dong Sung’s Vice Chairman, Mr. Kim Yun Soo. We are blow away by the handwritten letter received by Efekto, our partners in South Africa, written by gentleman complaining about the removal of the cat from out BIO KILL Pet Care product. BioKill Extra GT wins PRODUCT OF THE YEAR 2015 in Portugal! F.Lima S.A has received the award ”Product of the Year” for BioKill Extra GT! Consumers from various regions of Portugal were asked to participate in a survey conducted in 2014. Now in March 2015, results are in and BioKill Extra GT has been announced as the winner! Dong Sung BeFe’s 27th Annual Baby Fair! Once again our South Korean partners, Dong Sung Pharmaceuticals, exhibited great professionalism and passion for BioKill at BeFe’s 27th annual Baby Fair! The event is always an excellent opportunity for all parents who are interested in using non-harmful insecticides around their young children and babies. And it certainly was hard for anyone to miss BioKill’s bright yellow catching the attention of all those passing by. NAFDAC approval in Nigeria: Done! Approved register! Yes that’s right! The National Agency for Foods, Drugs Administration and Control (NAFDAC) registration in Nigeria has finally come through! We are stoked by this achievement as it is by far the most challenging step within the process of registering products in a new country. ENPRO celebrates 20 years of Successful BioKill Partnership with Jesmond! 20 years gone in the blink of an eye- and now in 2014 our Italian partner – ENPRO – invited to celebrate 20 years of successful partnership with Jesmond! ENPRO has been since the very beginning an ever-so-valuable and appreciated partner, with whom we hope to share many more years of BioKill success with! Being the first SME Company to have the first electro-mobile commissioned in the area of Sai Kung, here you can see an image of the vibrant automobile our partners in Hong Kong have sent us! Way-to-go! Dong Sung Bio Pharm. Co., Ltd., our long standing Korean partner, has marketed BioKill with great successes over the years, one of the most recent we are pleased to be able to share with you! Bio Kill goes to Bad Erlach! After so many months of preparation, it´s all over!…. BUT … what a success! Taking place at the Linsberg Asia Therme in Lower Austria, Jesmond had the pleasure to witness our partners from so many different parts of the world including Asia, Africa, North America, and all over Europe, interacting all together at one event. Thank you to all for your participants and for the great feedback we have received following the three-day-event. From our side we also heard many enjoyed the trip and, well, the spa wasn’t bad either for some relaxation after a hard-day´s work! Presenting the Bio Kill micro-fast revolution! Bio Kill micro-fast is the latest addition to the Bio Kill product portfolio. It is a fast acting insecticide utilized to eradicate and control all life stages of flying and crawling pests. Although mainly intended for inside eradication, it can also be used outside on all surfaces such as on organic, synthetic and wood areas. We are proud to present this news coverage from our long-standing partners in Hong-Kong reported by News channel CNN. Apart from distributing a wide-range of Bio Kill products within their market, BioCycle additionally offers both domestic and commercial locations a chance for a pest-free environment with their successful PCO pest-control business.